Several years ago while we were living in Switzerland, my daughter came home from a friend’s house and told me she drank the most delicious milk in the world that day. The milk came from a Molkerei – the Swiss German word for a dairy store – in a small mountainous village called Schonried that overlooks Gstaad. With no preservatives and an off-white color (because the milk is not bleached), the milk from Schonried was creamy and delicious – just as one would expect from a Swiss dairy. 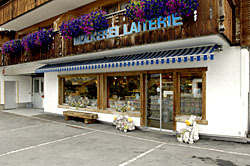 Molkereis are very common throughout Switzerland and reflect the country’s obsession with cows and dairy products. Cows are treated like Gods in Switzerland where they are the ultimate snowbirds: spending eight months of the year grazing on the low-lying plains and the remaining four months summering in the mountains where cooler temperatures prevail and presumably they will be happier and produce more milk. 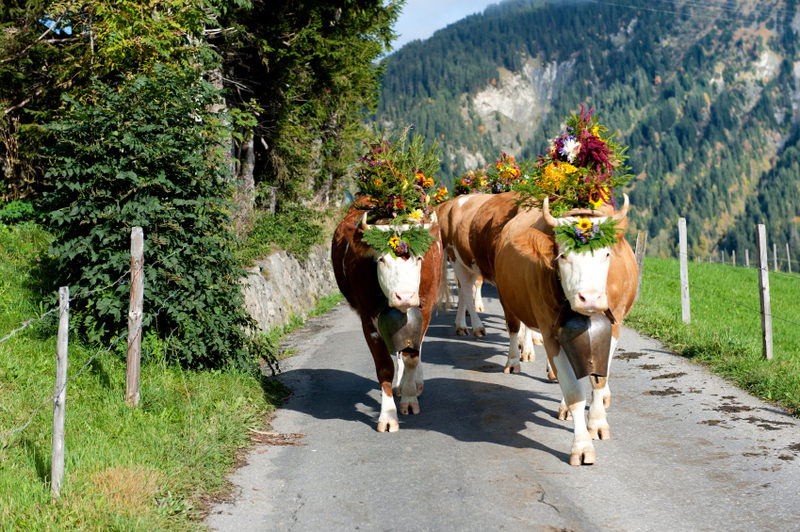 In late September throughout Switzerland (as this is one topic the Swiss-French, Swiss-German, and the Swiss-Italian all agree on) the cows are led down the mountains and through the villages in a parade called “desalpe” which means welcoming the cows back to the plains. Bells are hung from the necks of the cows and brightly colored flower arrangements are secured to their heads, the largest of which is worn by the cow that produced the most milk. Villagers gather and watch the procession admiring the beauty of the beasts that produce the milk they rely on to drink and use to make yogurt and cheese. In Switzerland, most milk is full fat (3.5%) and the flavor is unlike anything I had ever tasted: creamy with the most subtle taste of sweetness. My daughter aptly refers to the milk in Schonried as “milk with extra deliciousness added.” Only a child could state the truth so succinctly. Low fat milk has 2% milk fat and there is no such thing as skim milk. The Swiss realized long before the rest of the world that skim milk doesn’t have much taste. Better to have a small portion of the real thing that a full portion minus the taste. The Molkerei in Schonried has their own herd of cows that produce the milk which is bottled or used to make yogurt and cheese. One day, I asked the owner of the Molkerei what made their milk and yogurt so delicious and she smiled and said “the cows.” She explained to me how well the cows are taken care of, their grass rich diet, and concluded by saying “if the cows are happy, they produce more milk.” It was as simple as that. Made in about a dozen flavors, my refrigerator held neatly lined rows of strawberry, raspberry, mixed berry, and lemon yogurt jars with white plastic pull off covers that simply list the flavor and the few ingredients: milk, cream, fruit, sugar, and sodium citrate. How could something so delicious contain those few ingredients and then it occurred to me as I remembered my conversation with the owner of the Molkerei. It’s the cows and the quality of the milk they produce that make the yogurt so good. Short of getting my own cow, I would never be able to replicate their yogurt in my own kitchen although I did bring those white plastic covers back with me. From time to time I take those circular covers out of my junk drawer to remind me that really good yogurt does exist. All the more reason to return to Schonried one day.